This year, separatist claims have resonated globally across a range of contexts. From the brutal ongoing oppression of the Kurds longing for Kurdistan, to Catalonia, subsumed (increasingly violently) within the Spanish state, to the continuing advocacy for Tamil Eelam in the wake of genocidal violence by the Sri Lankan state; separatism is being considered and theorised anew. These claims are often made on the basis of territory as spaces for self-determination of a ‘people’ bound by culture, history, ethnicity, and/or ‘ties of mutual affection or sentiment.’ They also arise from the unbearable situations in which the self-defining ‘people’ find themselves. Hamja Ahsan’s book, Shy Radicals: the anti-systemic politics of the militant introvert, draws our attention to a largely unacknowledged, yet ubiquitous oppressed people, whose voices are drowned out by their oppressors and face marginalisation and discrimination across states, class, race, gender and sexuality. Cruelly, this systematic silencing is abetted by the people’s own preference for solitude and quiet, and fear of public speaking. Ahsan’s book calls for the acknowledgement of the situation of Shy people in an extrovert-supremacist world. It is a perceptive and entertaining analysis of late capitalism’s aggressive invasion of our senses, time and privacy. The separate state of Aspergistan, the Shy Radicals political project, is imagined as a safe haven for Shy people, introverts and those on the autistic spectrum. It is designed for those who seek a quiet, unharassed existence, free of intrusive advertising, neon and strobe lighting, and compulsory social events. Aspergistan’s Constitution is set out in detail in the first pages of the book, establishing its political and social ideals in articles that are appealing, sensible and very amusing. Hamja Ahsan is well versed in the language of struggle — he is an activist, writer, curator and artist. 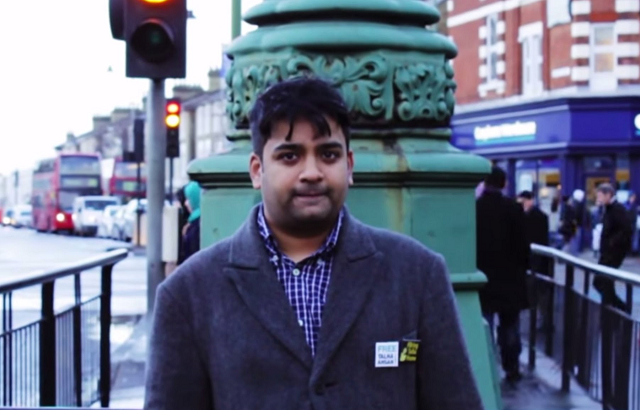 He was shortlisted for the Liberty Human Rights awards for the Free Talha Ahsan campaign. His vision of Aspergistan provides a gentle and revealing analysis of structural violence. It is a political project arising from personal experiences (the first line in the acknowledgments is: “This book is written on the back of a lifetime of resentment”). It is also intensely relatable. The promise of Aspergistan will appeal to the bullied, the socially awkward, the introverted, the marginalised and the medicalised, and to all self-identifying Shy and autistic spectrum people. It imagines a world in which we value and give apposite space to ‘alternative,’ quiet and nonconformist ways of being. In our world of celebrity culture and reactionary politics, where the loudest and often the most obnoxious voices shape public debate and hold political office, this book describes a fictional but compelling project of radical societal transformation. In a funny and insightful way, Ahsan highlights how power is communicated and attained in social situations and in political performances. 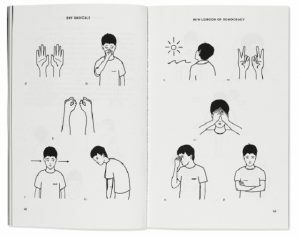 The ‘new lexicon of democracy,’ beautifully and simply drawn by the artist and zine-maker Rose Nordin, visualises Aspergistan’s recognised and approved political communication through body language. These gestures include slouching, curling up on the floor, deep sighing, and standing by a wall. Ahsan asks us to imagine a world in which political campaign leaflets are unobtrusively scattered on park benches for the population to pick up, if they feel like it. Compare that to the glaring, professionally oratorial and expensive campaigns of our contemporary politics. Imagine a world in which one is encouraged to contemplatively read manifestos (again, if one feels like it) rather than consume catchy and reductive soundbites. The neologisms that Ahsan introduces throughout the book are brilliantly funny: the militant underground movement is called the Introfada, the state will be subject to Shyria law, and House Introverts are deemed as every bit as dangerous as the explicitly extrovert Trendy Club. The entire book is written through with a biting but hilarious critique of liberalism and conformity. The heroes and cultural representatives of the Shy Radicals movement include Rosa Parks, Wednesday Addams, Splinter (the sensei of the Teenage Mutant Hero Turtles), Ali La Pointe (the Algerian guerrilla protagonist of the Battle of Algiers), and Lisa Simpson. 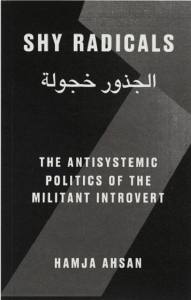 Through (imaginary) interviews with political prisoners of the Shy Radical movement and individuals who contributed to the oral history project of the (imaginary) Introvert Rights Association, Ahsan overturns contemporary social and politic realities. Shy Radicals offers a lens through which to see the world: it will make you laugh, prompt you to recognise the violence of loudness, and tempt you to contribute to this creative state-building project. I imagine that the establishment of the state of Aspergistan would lead to mass visa applications. Asylum, of course, according to the Constitution, will be granted to all Shy peoples suffering persecution in extrovert-supremacist states. Rachel Seoighe is a Lecturer in Criminology (Human Rights and Criminal Justice) at Middlesex University. She writes about state violence, political agency and resistance, contemporary detention estates — including prisons and immigration detention centres — and Tamil politics. Her book 'War, Denial and Nation-Building in Sri Lanka: After the End' (Palgrave MacMillan) is due to be published in November. You can find more of her writing in Border Criminologies ( here and here ) and Discover Societyand listen to her talk about the closure of Holloway prisonhere(as part of her work with Dr Carly Guest) She tweets at @racheladrianne.